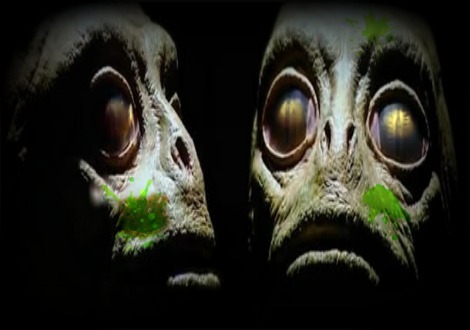 Reptilians Massacred by Turkish Military? I am a Chief Engineer on an Offshore Supply Vessel, and the events I am going to put forward are accurate, to the best of my knowledge. The scene lasted about 40 seconds. The craft rose up out of the water (Gulf of Mexico) about 40 feet, no water was dripping from the craft. Within a split second the craft disappeared at a 30 degree angle into the sky. Speed appeared to faster than speed of a light turning on in a room. Within seconds it had disappeared completely. I can say for sure that the craft was dark colored, oval in shape and made no sound whatsoever. With as many rigs (2), there has to be more witnesses than just the four on our vessel. A car enthusiast got quite a surprise when he reviewed a recent photograph he'd taken of his vehicle. The peculiar image, which was recently shared on our discussion forum by user 'XSAS_Daughter', shows what looks like a strange face peering out from the car's front passenger window. "My friend was recently looking back through his camera roll and found this photo that he took of his and his friend's car," she wrote. "He was sat in the restaurant across the road and was taking a photograph of his car because it was new and he's a typical boy that loves his car." "He realized there appeared to be a person in the car, which was completely empty at the time." "I said it looked like somebody was leaning on his car and he said there definitely wasn't anybody because he would have kicked off haha!"